Dr. Thomas Harvey is Board Certified in Ophthalmology and licensed in Wisconsin. He performs a wide variety of refractive procedures and has expertise in laser vision correction, incisional astigmatism reduction, phakic lens implantation, and refractive lens surgeries. His core goal is to provide the safest, best quality of vision correction for the patient considering surgery. 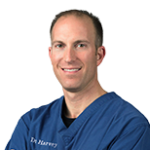 Dr. Harvey graduated with honors in genetics from the University of Wisconsin-Madison and later attended medical school at the Medical College of Wisconsin. He completed his ophthalmology residency at the University of Pittsburgh, where he was Chief Resident. After residency, Dr. Harvey received specialty training in cornea, anterior segment, and refractive surgery at Baylor College of Medicine in Houston, Texas. Following medical school, Dr. Harvey was awarded the Outstanding Transitional Year Resident Award during his internship at St. Joseph’s Hospital in Milwaukee, Wisconsin. Dr. Harvey’s ongoing participation with national committees for cornea and refractive surgery reflect his commitment to excellence in these fields. For three consecutive years, he served on a missionary surgical team in Honduras. In addition to seeing patients, Dr. Harvey has various research interests, including lamellar corneal transplantation. Dr. Harvey is currently a member of several organizations, including: the American Academy of Ophthalmology, the American Medical Association, the State Medical Society of Wisconsin, the American Society of Cataract and Refractive Surgery, and the Wisconsin Alumni Association.